The 1970 Plymouth Cuda is a beautiful re-design of its previous models. An increased width of 5 inches allowed more powertrain options. The uncluttered and clean appearance of this truly respected and memorable Plymouth was designed by sheet metal and styling. The smooth features of the exterior side were fenders, quarter panels with flush mounted door handles. The grill had single headlamp, two rectangular inlets with urethane coated electrometric bumpers which were optional. The Cuda looked like a pony car with the long hood and deck lid. Interior features such as high back buckets, steering wheel, smooth edges, large gauges and door panels gave a new look to the car. The 1970 Cuda was available with options like rear spoiler, rear window louvers, Hurst pistol grip shifter, Ralleye wheels, hood scoops, fog lamps, hockey stick striped quarter panels with attractive colors of TorRed, Lemon Twist, In Violet, Vitamin C and Lime Light. The Cuda 70 cars were considered as the most valuable Mopar muscle cars which were available in coupe and convertible models. There was 21,017 Cudas produced during the 1970 model year. The 1971 Plymouth Cuda saw some changes from the 70 model which included a cheese grater grill with 4 headlights, tail lights, fin like vents on fenders. The model included billboard decals which were optional on quarter panels covering door to rear side of the Plymouth car. 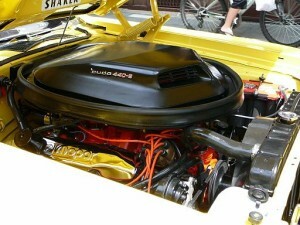 The engine sizes during the year were 340, 383, 440 and hemi with optional electrometric bumpers. Interior of the car was upgraded with good seats and grip with options of split buckets. With minimal styling changes, the 1971 Cuda was most sought after by the people. Coupe and convertible models were available and totally 6602 Cuda cars were produced during the year. The Plymouth Cuda muscle car was released in 1972 with drastic changes from its previous models. During the period of the car, just like Detroit muscle cars, the Plymouth also faced issues of insurance pressures, gas shortages and emission standards. The features of the old model such as shaker scoop, shaker and big blocks were changed by small low compression blocks. 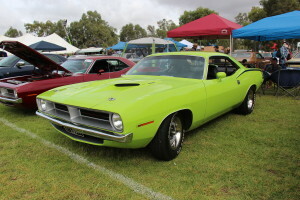 The exterior Cuda had minimal changes. The single headlights of the 1972 Cuda were just like the 1970 model. Instead of using horizontal blind style which existed in the models of previous years, large dual round unit tail lights were used in the 1972 Plymouth Cuda model. There were some minor exterior changes which included optional striping and not hockey stripe or billboard. The interior of the Cuda looked much the same as its previous models. But the advertisements of the car boasted standard bucket seats offering the users better grip and comfort compared to its previous models. The 1972 Plymouth Cuda was available in two basic options viz., 318 2bbl or hi performance 340 cid motor. The Plymouth Barracuda was available with a 4 speed including a pistol grip shifter. The 1972 Cuda came in a Coupe model. The 318 cid model had engine options of 8.8 Comp., 150 HP with standard motor whereas 340 model had engine of 8.5 Comp., and 240 HP. 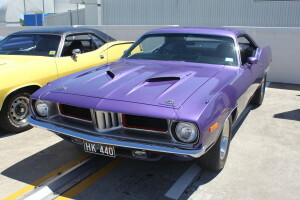 During the year 7828 total Cuda cars were produced much to the muscle car crowds enjoyment.